A still life and animal painter, John Sherrin was born in London in 1819. He worked mainly in watercolors and was a pupil of the famous still life artist William Henry Hunt (1790-1864) from whom he learned to paint nature with complete fidelity. Sherrin skillfully manipulated his watercolors to portray even the slightest detail in nature and included a misty film in his works that copied the effects of the early morning dew on small buds and twigs. 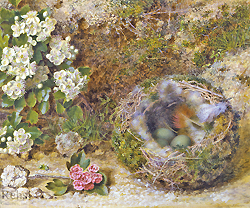 Sherrin is considered to be a member of the "Bird's Nest" School a group of artists who share a common trait of including bird’s nests and eggs frequently in their works, although their skills, techniques and training differed from each other. Sherrin was a frequent exhibitor at the Royal Academy from 1859 to 1894 and he showed at Suffolk Street and the New Watercolour Society (RI), where he became a member as well.